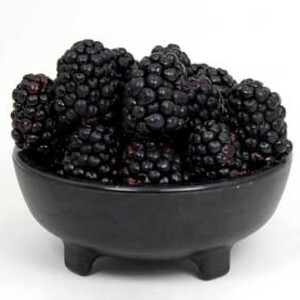 Blackberries are known for a deep purplish-black color; tiny, seeded lobes surrounding an edible core; and sweet flavor. They are harvested from a variety of bramble bushes and are members of the rose family. These little fruits grow worldwide, but North America produces all commercial harvests, with the highest production in Oregon. Not only are they delicious fresh or as a jam or in pie, they’re made into wines and liqueurs such as crème de mûre. Blackberries that grow as ground runners are called dewberries. Blackberries are also sold frozen and canned. The bulk of blackberry production is used for processed jams, jellies, and pie fillings. Boysenberries, Marion berries, loganberries, and youngberries are hybrids – a blend of blackberries and raspberries. Summer is peak growing season. Buy locally if possible. Berries should be dry and reasonably firm with few color variations. Those with stems are not ripe. Deep color means sweeter berries. They mold and are crushed easily. Inspect containers carefully. Blackberries spoil quickly. Refrigerate in a colander or separate on a plate and use within two days. Freeze berries on a tray, then place in a plastic bag. Do not rinse until ready to use. Cleaned berries will turn mushy quickly. When preparing fresh blackberries for a filling, strain the seeds. Use berries only in thicker batter to prevent the fruit from sinking to the bottom. Blackberries taste best when brought to room temperature. One pint of blackberries is equal to approximately two cups (they’re usually sold by the half-pint).